Today’s #VeteranOfTheDay is Coast Guard Veteran Holly Shaffner. Holly served from 1987 to 2011. Holly served as a fire control technician from 1987 to 1997 before she joined the Staff and Command Cadre for Officer Candidate School. She participated in Operation Desert Storm, Operation Iraqi Freedom and Operation Enduring Freedom. Holly served on Coast Guard ships in the Bering Sea for eight years and later worked to intercept drug traffickers and illegal migrants throughout the Caribbean. At the end of her career, Holly ran a 24/7 emergency operations center. 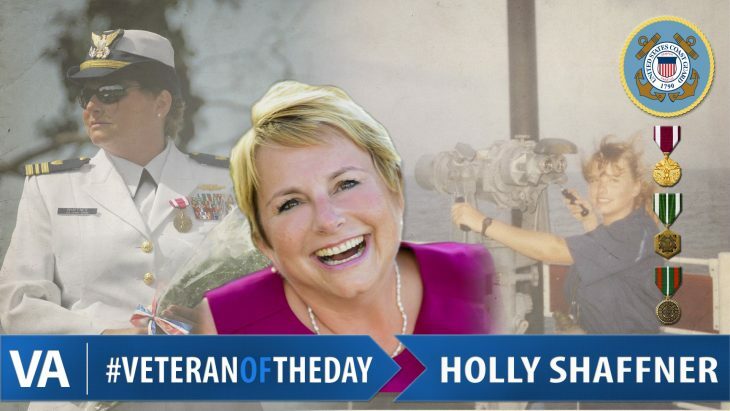 During her career, Holly was a part of the Haitian repatriation in 1994, where she trained over 200 Coast Guard Reservists after 9/11. She also served as second-in-command of a 74-person anti-terrorism team that was among the first responders after Hurricane Katrina and helped rescue countless victims. She enrolled at San Diego State University and pursued a degree in journalism with an emphasis in public relations after her retirement. Holly is currently the Military Liaison Officer at SDSU and assists service members, Veterans and military families with the school’s admission process. She also volunteers with Honor Flight San Diego, the Veterans Museum at Balboa Park and the American Cancer Society. Holly is an avid golfer and was one of 11 women to play in the first Veterans Golf Association Championship in 2015. Holly received the Coast Guard Meritorious Service Medal, Coast Guard Commendation Medal and several Coast Guard achievement medals. Thank you for your service, Holly!